Jeannie Barbour and Esther Luttrell follow the formative years of this real life storyteller who is considered an Oklahoma treasure. 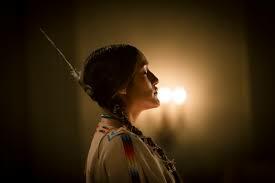 Q'orianka Kilcher plays Mary Francis as a young adult. She is set on going to Oklahoma College of Women, but her father is J.B. Thompson (Gil Birmingham) is afraid of how the white people will treat her. He would like her to stay home and live a normal life. Her mother Bertie(Brigid Brannagh) and her uncle, Douglas Johnston(Graham Greene), the Governor of the Chickasaw Nation, encourage her as she has a gift of communication. At school she gets the attention of the drama teacher Miss Davis (Cindy Pickett) who helps her develop her ability to perform her native stories. After she graduates, Miss Davis recommends her to Carnegie Institute. In the meantime she travels on tent show circuit that travels around the states while she hones her skills. She meets with other tribes who give her their stories so she can share with the world. Carnegie rejects her application, but Mary, who has changed her name to a stage name of Te Ata (bearer of the morning) travels over 1000 miles demanding an audition. Which of course, she wins. To help support herself, she auditions for other productions, but is often competing with blonde actresses. The constant rejections almost sends her back home. Miss Davis helps out by setting up private performances one of which is in front of Eleanor Roosevelt when her husband was governor of New York. Te Ata, finally makes it to Broadway, but despite the good reviews, she feels there is something missing. Her boyfriend Dr. Clyde Fisher(Mackenzie Astin), a professor of astronomy helps her realize that she is happiest when she is telling the stories of her people. The laws of the land at the time made it illegal for Native Americans to sell their art and dance in their ceremonies in order for them to assimilate into white culture. Most of the white characters in this story are accepting of Native Americans, but there are some smarmy supremacist types twirling their mustaches. Still a reminder on how this country treated people of color that seems to be relevant today. Returning home, Te Ata finds her father is ill after government agents raided his store of all the native goods. The crafts the local families need to sell to support themselves. When Te Ate receives an invitation to perform at the White House, she tells her father she will stay home if he will not die on her. Finally realizing that Te Ate has a gift to share and being an unofficial spokesperson for all aboriginal people. Her legacy has been honored by the State of Oklahoma, by the Chickasaw Nation, and many book, plays and movies. She performed all over the world, including the Queen of England. As part of the history of this country it's a worthwhile subject to cover. The movie itself has that Hallmark/Lifetime movie of the week feeling to it's production. Very pastoral and sincere feelings, but lacks any potential dangers. Good for the whole family. I got this web site watch series free from my pal who told me on the topic of this web page and at the moment this time. A great movie is an ideal time pass as it not only entertains you but also offers you the very best exposure on your treasured generic. find it here more about link. More information on movies on https://watchseriesnet.net/watch/madagascar-2005.html. Dunkirk is an excellent movie for everyone who enjoys an excellent historic action film on Watch Full Annabelle 2 Free - 123Movies which is full of drama. Though there are many websites which may help us watch absolutely free movies online but major of them usually have streaming troubles. More information about movie4k com on movie4kcom.com.